The SGA Executive Board with Dr. Walter May, Sloane Day, Jonathan Morris and Alex Bryant. By the end of training with Reinhardt’s Student Government Association, SARCRAFT owner Alex Bryant ‘15 felt the last few years of his life come full circle. 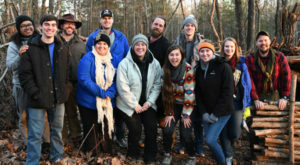 The SGA Executive Board spent a day with SARCRAFT, the outdoor skills school Bryant owns with his friend, Jonathan Morris, in Waleska, learning fundamental skills for surviving in the wilderness. Skills included assembling necessary pieces to start a fire, building shelters and obtaining water. The leaders then split into two teams and competed to see who could meet the “core four” basic requirements for survival with 10 less-than-ideal items in two hours. “Through this training, our team received practical outdoor skills plus confidence, perspective and leadership experience in a field outside of our day to day classroom lives,” said student body president, Levi Cochran. “For me, to be able to serve these students from my beloved alma mater through the services my company provides, and to be able to contribute value to the Reinhardt community while building my business at the same time, that’s about as good as it gets,” said Bryant. Bryant served on SGA beginning his freshman year. He was elected SGA president his senior year. He felt the services his wilderness training courses provided would bode well for the Executive Board by creating a unique bonding experience to be challenged outside their comfort zones in a supportive environment. “I believe there are few bonds greater than those formed through ‘shared suffering’ to achieve a set objective,” said Bryant. The skills gleaned from this training go beyond the woods, as the leadership and survival knowledge will reveal itself to these students as they continue their education and prepare for their careers.